Artworks painted on stone by Đậu Quang Thành. An artist called Quang Thành grew up poor in the central province of Hà Tĩnh. He had to work after finishing school but always had a passion for art. Eventually he went on to study art. He made a name for himself painting pictures on rocks of many different shapes. Đậu Quang Thành’s skill of painting on rocks has earned him the nickname, Thành The Rock. Once a poor student who used to sketch portraits for tourists to earn a living and afford his studies, 31-year-old Thành has today become a famous artist in Nha Trang, in the coastal province of Khánh Hòa. Thành was born to a poor family in the central province of Hà Tĩnh. After finishing high school, his parents could not afford for him to study further, and Thành had to work to make ends meet. He had a passion for painting since he was young. He interrupted his studies for two years and got admission into Huế University of Fine Arts to pursue his dream of being an artist. There, he had the opportunity to learn professional painting. Even during his school days, Thành used to sketch portraits for tourists in Huế City. He graduated in 2013 and moved to Nha Trang to start his career. After painting on many materials, including canvas, paper and walls, the idea of painting on stones came to him when he noticed stones with strange shapes on the bank of a river. “Once when I had gone on a picnic with friends, I saw stones of various sizes and shapes that intrigued me and I tried to paint on them, to turn the lifeless stones into lively artworks," Thành says. “What can you do with your painted stones? Lots of things. Turn them into magnets, decorate your garden and home, make paperweights, write inspirational messages on them,” Thành says. He soon found an endless inspiration to paint on stones, although he faced some difficulties. “The first problem I faced was getting on well with the new material as the surface of stones is not flat and smooth,” he says. 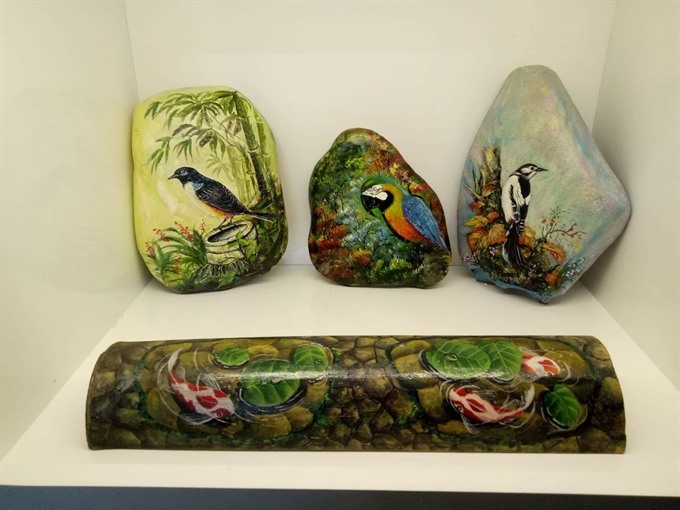 He mastered the art gradually and was able to paint on both smooth, rounded stones and rugged stones, with each stone offering a different experience and inspiration. “Each stone is perfect and can have a different effect,” Thành adds. He often wanders along the bank of rivers and streams to collect stones. Sometimes, he rides a motorbike to a mountainous region 50km from Nha Trang to find stones. Though his favourite subjects are landscapes and animals, he collects any stone with a unique shape since he knows how far his imagination can drive him. After collecting the stones, Thành washes them with water and soap and pats them dry. He first paints a layer of coating on the stones. Then he uses a pencil or chalk to draw small details. The main part is painting on the stones with acrylic colours. Once he finishes painting the design, he covers the stone with a coating of PU (polyurethane) glue to ensure the artwork lasts long. He uses a hairdryer to dry the paint faster. When Thành first uploaded pictures of his artworks on Facebook, he did not expect many takers. But he soon started receiving orders for painted stones. A skill is a talent. A nickname is a casual name, usually used by close friends. Portraits are pictures of people’s faces. To make ends meet means to earn enough to survive. He had a passion for painting since he was young. If you have a passion for doing something, you love doing it so much you do not worry about how much time, or money, you spend on it. He interrupted his studies for two years and got admission into Huế University of Fine Arts to pursue his dream of being an artist. Interrupted means got in the way. To pursue a dream means to follow a dream. There, he had the opportunity to learn professional painting. Even during his school days, Thành used to sketch portraits for tourists in Huế City. An opportunity means a chance. He graduated in 2013 and moved to Nha Trang to start his career. To graduate means to finish a course and receive a certificate for having passed it. Turn them into magnets, decorate your garden and home, make paperweights, write inspirational messages on them,” Thành says. Magnets are metal pieces that attract one another and stick together. To decorate a place means to make it look pretty. Inspirational messages are messages that make you want to do something positive after reading them. To master the art of something means to become good at doing it. The main part is painting on the stones with acrylic colours. Acrylic is a type of paint. Apart from painting stones following orders from souvenir shops, Thành also paints murals for tourist sites and cafes. Murals are paintings on walls. Đậu Quang Thành’s nickname is Rocky Thành. Đậu Quang Thành studied at the Huế University of Fine Arts. All stones that Đậu Quang Thành paints are exactly the same. Đậu Quang Thành used Facebook to show the public his pictures. Đậu Quang Thành would never paint for tourists. 1. False; 2. True; 3. False; 4. True; 5. False.